Going into spring practice there is no doubt about who the starter will be. 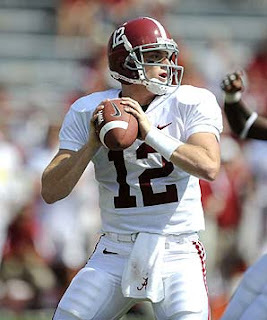 Greg McElroy, who lead the Tide to its national championship last year will be the obvious number one and will again be the leader of the offense. At this point, unless Greg suffers a serious injury, it is his job. The questions for the depth chart start on the backup. Last year, Star Jackson shared the backup role and there were even talks of him challenging for the starting spot this time last year, however throughout the spring we saw Greg take job and Star was pushed to the second spot. This year, Star will have to compete for the same slot against redshirt freshman A.J. McCarron, who last real competitive football was played in high school at St. Paul’s in Mobile Alabama. While there is no doubt about Star Jackson’s talent as a quarterback, the real question for him is how he fits into the mold of quarterback that Nick Saban has created. McCarron, who also seems to have the backing as the in state native, has the most potential to take the second spot. However, this year for him will be a learning year so that he will be ready to take over the team as the starter in future years. Though his potential down the road is huge, he must learn to manage a game and not make mistakes. As for Star, depending on how his spring goes, he has probably two choices. Take the third, possibly even forth spot in the chart as a QB, or make a move and contribute at another position. The last question for the quarterbacks is what to do with incoming freshman Phillip Sims, the stud pro-style quarterback out of Virginia. Unfortunately for him, there is probably a red shirt waiting for him at the end of spring. With McElroy, McCarron, and Jackson already on the depth chart ahead of him, there is little chance that he wont be sidelined this season. But, much like McCarron, once he gets one season of practice under his belt, look for him to challenge for a spot higher on the depth chart.